Amid an international dispute with the US and currency crisis, Turkish President Recep Tayyip Erdogan has called for Turkey to boycott US products. Shortly after, some particularly patriotic Turks answered their president’s call by smashing iPhones and posting the video footage on social media. Last week, President Donald Trump announced that he would be doubling tariffs on imported steel and aluminium from Turkey. The tariffs on Turkey are believed to be retribution for Turkey’s imprisonment of US citizen and pastor Andrew Brunson. This week, Erdogan responded by issuing half a million in tariffs against American goods including cars and coal. The Turkish president has also called for a boycott of American made electronics and accused the US of starting an unjust economic war against Turkey, a fellow NATO partners. He specifically encouraged Turks to give up their iPhones and purchase Samsung products instead. The Turkey-US dispute is centered around US Evangelical pastor Andrew Brunson. Brunson, who has lived in Turkey for 23 years, was arrested in the months following the 2016 coup attempt against President Erdogan. Following the coup attempt, the Turkish government lead a massive backlash against journalists, opposition figures, and NGO workers, many of whom were jailed. Following the failed coup, Erdogan arrested 50,000 people living in Turkey. Brunson was swept up in the Erdogan’s retaliation and arrested on espionage and terrorism charges. He has been imprisoned for two years, but was recently placed under house arrest instead due to health concerns. Brunson stands accused of collaborating in the coup attempt against Erdogan and supporting the Kurdistan Workers’ Party (PKK), which has been outlawed as a terrorist organization. President Trump has called for the release of Brunson, tweeting, “this innocent man of faith should be released immediately.” Vice President Mike Pence and other American leaders have echoed President Trump’s demands. While President Trump’s supporters point to the sanctions against Turkey as proof of Trump’s America First policies and defense of Americans everywhere, critics of the US President claim it’s all just a political charade to gain leverage over Turkey. Whatever the truth may be, if Trump can secure the release of Brunson, it certainly won’t hurt his support from Evangelical Christians. To show their support, some Turks have filmed videos showing them patriotically smashing iPhones. In one video, four boys kneel in front of a Turkish flag while a man speaks to the camera. Addressing President Donald Trump, the man says, “If you threaten us with hunger you will only make us laugh. Do whatever in your power.” The man then begins smashing iPhones with a hammer. 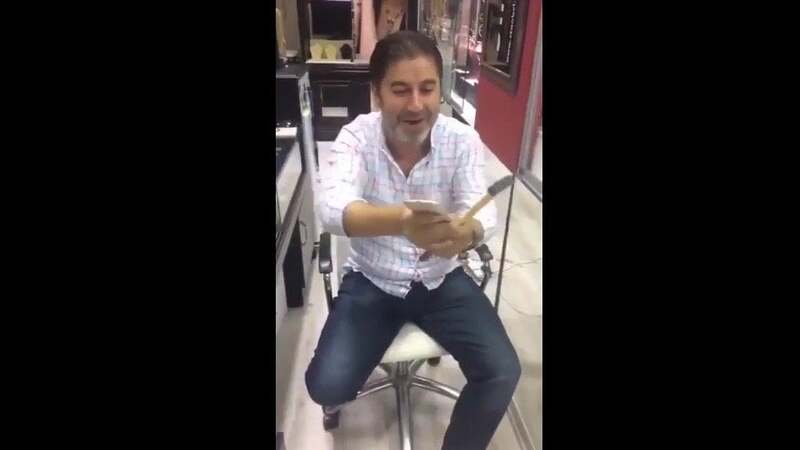 Another video shows a leader of the Turkish Nationalist Movement Party asking his colleague to smash his iPhone. The fellow party member does so, throwing his iPhone to the ground and stomping on it before declaring, “the U.S. is being dragged across the floor.” Some videos are slightly more violent. In one a man shoots his iPhone with a handgun. Even young children are participating in the social media led boycott. In a video circulated by an Israeli journalist, a young boy pours his Coca Cola down the toilet. Along with videos of Turks smashing iPhones, Erdogan’s supporters have also taken to the streets to tear up fake American dollars. Is the Crisis Hurting Erdogan? While Erdogan has been blaming the US for Turkey’s economic woes, in reality, the Turkish lira had been falling in value for months, while the Turkish economy continues to approach dire straits. After Erdogan placed his son-in-law as finance minister and Turkey’s central bank refused to increase interest rates, many Turks blamed Erdogan’s authoritarian policies for the economic crisis. Now, sanctions and tariffs from the US provide a convenient scapegoat for Erdogan to draw attention away from his own failures and increasingly authoritarian rule. The dispute with the US has also provided Erdogan with a nationalist rallying point. Last week, Erdogan said, “There are various campaigns being carried out. Don’t heed them. Don’t forget, if they have their dollars, we have our people, our God.” He has called for citizens to aid in the “national struggle” by using their US dollars, euro, and gold to buy Turkish lira. Erdogan has also attempted to use the economic crisis to position himself as the champion of the people, standing up to economic attacks from the US. The Turkish lira recovered slightly today after Arab nations pledged billions of dollars in funding to the Turkish economy. However the recovery was minimal, not enough to be deemed a comeback.